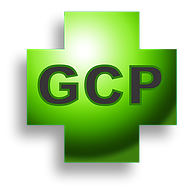 GreenCrossPharmacy.online is the domain address name of the Green Cross Pharmacy which is an online pharmacy that claims to be specializing in providing the community’s PrEP at the best price since 2015, or at least that’s the information that you can read as soon as you access their main page. Also, as much as it seems, we’re currently dealing with a 3 years old pharmacy and although that’s not a lot, 3 years is a good amount of time to have trust in the pharmacy, in case that’s true. The pharmacy is also claiming that they are offering shipping medications to a total of 51 countries and people can see the full list, something I will talk about later in my review. As much as it seems, the pharmacy is only oriented in selling PReP medications and medications for HIV treatment ARVs. For those who don’t know – PReP is a way for people who do not have HIV but who are at substantial risk of getting it to prevent HIV infection. So this is an online pharmacy which is only selling medications to either prevent or treat HIV. The pharmacy claims they offer both generic and branded medications. In addition to this, the pharmacy seem to be an active social media user as people can find their social media pages on both Facebook and Twitter to follow the company’s activity. I was not able to find an exact address of the pharmacy, but I did found their post address located in Mbabane, Swaziland which is in South Africa. The pharmacy seem to have a rather strange website, or at least it doesn’t look similar to some other ordinary pharmacies out there. It seems that it is the same site but the domain age is only changed to – generics.greencrosspharmacy.online. On this page, which is very similar to the main page, you can see information suggesting that if you don’t see your medication then you can email to them to put it online. This means that you still have chances to get the drug that you need but not listed online from this site. However, also on this site, you can see that they are offering different medications for other different health conditions as well. There’s a list of drug categories with medications for: antibiotics; anti cancer; antipsychotic; anxiety depression; diabetes; cholesterol, erectile dysfunction; migraine; nerve pain and others. So as much as it seems, the pharmacy does offer a wide selection of medications and not only for HIV treatment or prevention. As promised, all products you can find here are only generics. I checked their ED drugs and I found quite a good number of these medications. All in all, this pharmacy is offering only branded medications for HIV prevention or treatment and many other forms of medications for other health conditions in their generic forms. You can also ask them to add another drug that you might be looking for but it is not listed on their site. For these reasons, since they seem to offer a lot of drugs, although they are a pharmacy oriented in selling HIV prevention and treatment drugs, my rate is 5 stars for assortment of medications. 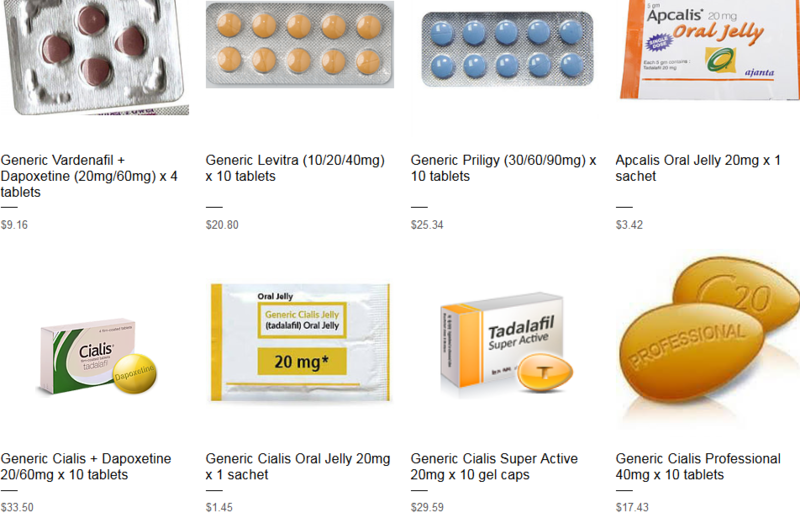 However, I am familiar with prices for ED medications and by searching for them I decided to check the prices of generic famous drugs such as Cialis. However those seem really strange prices. Not only because they are super low as much as it seems, but also because the price for 20 mg generic Cialis is lower compared to the price for any other lower strength alternative of generic Cialis. Analyzing the screenshots, pay attention that choosing the strength of 2.5 mg per pill then 10 pills would cost you 9.45 USD while if you choose 20 mg per pill then 10 pills would cost you 7.56 USD, something that I don’t find it to be too logical. For this reason, I am not sure if those prices are trustworthy. However, if those are real prices then I would say that the prices affordability is extremely good as I think that it is near to impossible to find other online pharmacies with lower prices. Here’s another example of generic Levitra. Then again, assuming those are real prices displayed my rate is doubtlessly 5 stars. However, not sure if those are prices we can have trust in. They also claim that if your country is not in the list then contact them and they are going to investigate it. According to the information there, they are offering different ways of shipping your drugs. As they claim it depends on the product selected and your choice in the shopping cart. These options include: DHL, EMS, ITP and RMS with various delivery times with the shortest 5 days and longest delivery time of 21 days. Here’s the shipping delivery times for each method. However they claim that delivery times are not guaranteed and they explain it because international shipping has a number of factors outside of their control. They are claiming that their couriers can’t deliver to PO Boxes or Locked Boxes. They claim that the tracking number and link is going to be send to email as soon as the order is shipped. They do not offer refund in case the parcel has not arrived. In fact, if the products didn’t make it to you and is returning back to the sender, they can send it back only if you pay again for the shipping. Unfortunately, a lot of information misses – such as what’s the time they would send your parcel after the payment? 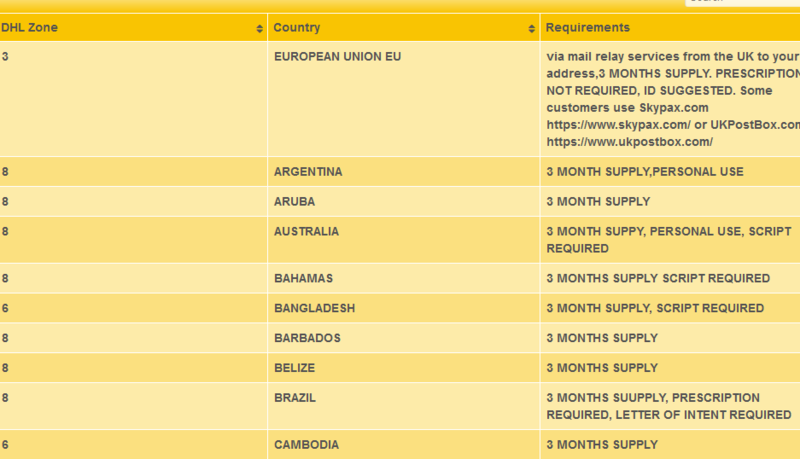 And most importantly – what are the shipping fees? I tried to check it by using the checkout and I noticed that you first off need to choose where exactly you need to deliver your drugs and then your shipping estimated fee would appear. 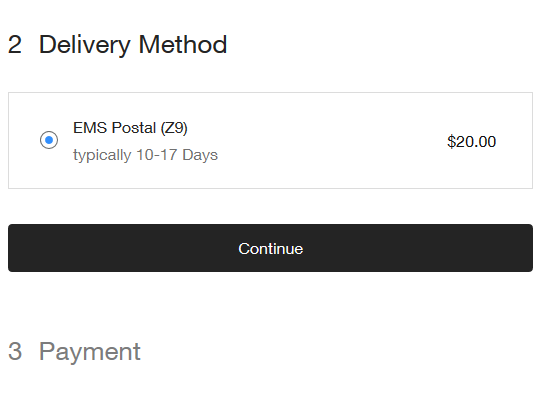 Choosing a random location, for example, USA, California, I discovered that the fee is 20 USD sent via EMS with delivery of 10 to 17 days but no other shipping option was offered. In the end, my rate is 2 stars – no overnight shipping option, limited options to choose from, high shipping fee and lots of information misses. The payment options are really strange at this online pharmacy. As much as it seems, they are mostly inclined to accept bitcoin, but they claim to accept other payment options. 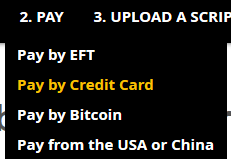 You can pay by EFT, credit card, bitcoin and from USA or China. each of the payment options have a page explaining how you can pay using that payment option as it is not so easy, not even if you’re using credit cards. Plus, you should ask them how you can alternatively pay with credit cards or if you’re a USA or Chinese based customer. My rate is 2 stars for all of this as although they have a number of ways to pay, there only seems to be headaches trying to use whatever method of payment. Unfortunately, Google’s PageSpeed Insights did not offered very good results when searching for the website’s technical characteristics. and to be honest, I did realized why as up until this moment, I did noticed the technical characteristics in terms of page speed loading and optimization. The mobile version is extremely low scored with 21 out of 100 meaning that delays would definitely occur and desktop version is a bit better, yellow market, but on the closer end to slow (red) rated with 59 points. For such technical characteristics, I can barely rate this online pharmacy’s website page speed with 2 stars. Those are some really poor indicators that site administrators should pay attention to. As we can see in the screen above, the pharmacy does seem to have a mobile version of their website being optimized for using it on a smaller screen. That’s a very big plus for this pharmacy as nowadays, more than 80% (according to some statistics even more than 90%) are using mobile phones. Usually, a big number of people out of those mobile phone users, are using those smartphones to check a website, an arranging orders online is not an exception. Nevertheless, I tried to access the site from my own smartphone and that wasn’t as easy as expected. I did got big page speed loading issues but not only – there’s a lot of secondary information on their website and I had to scroll down a lot until I found out what I needed. The site is offering a mobile version but it is not as easy to use it and I think that administrators should resolve this drawback. Until then, my rate can’t be any higher than 2 stars for such a mobile version. You can check if this online pharmacy is offering a protection of their website as soon as you enter their site by checking for a green lock near the address bar. If the lock misses, it means the site is not protected. Luckily, greencrosspharmacy.online does use a protection and a secure connection. But there’s the problem – I checked for more information and I found out that they are only using a 128 bit SSL encryption which is a lower security level compared to the 256 bit SSL encryption. I think that site owners should ensure the maximum security for customers. Plus to that, no owner information is given. For all these reasons, my rating is 3 stars for this unit. Regretfully, greencrosspharmacy.online does not use an antivirus software, which indicates that the users can infect their computer with viruses, malware and other threats when visiting its pages. So, green cross pharmacy can’t be considered the safest pharmacy to order drugs from. They should do something about that in order to make online shopping 100% safe. But until that moment, I need to score them 1 for this unit that seems to be neglected. How to Order From Green Cross Pharmacy? A big plus that I have found in regards to this online pharmacy is the fact that there’s no need to register in order to place an order and that’s really accelerating the process of ordering. According to the information on the site, there are 3 steps that you should complete before they can process your order. Those steps are mentioned right on their main page. so, after you have chosen your needed drugs, have chosen the needed quantity and dosage of the drug, you should add it to your cart and go to your virtual cart. There you can estimate the shipping depending on your location, add a note or enter a promo code. You can also see your medication review and the total amount of USD you should pay. Clicking on checkout you would need to fulfill different steps: shipping details; delivery method; payment and review and place your order. But remember that this is only the first step. Then remember that you should pay and fill up your prescription. I think that the ordering procedure is all good and fast until the payment. You should write them, sometimes even twice or more, just to make your payment. That’s really time and energy consuming. I think they should make an easier ordering procedure as the current one is too complicated. 2 stars for the convenience of ordering here. According to the information on scamadviser.com, this website doesn’t seem to be very trustworthy. That’s because it is a new website which has limited and hidden information. The site trust index is only 67 % which is not too low, but it is definitely not good. The site is only 1 year compared to how they promised – 3 years. Plus to that, the site location is hidden exactly as it is the owner information. The phone number is Canadian which is strange since this pharmacy didn’t seemed to have anything to do with Canada. My rate for all this information is 2 stars, given only because trust index is above 50%. 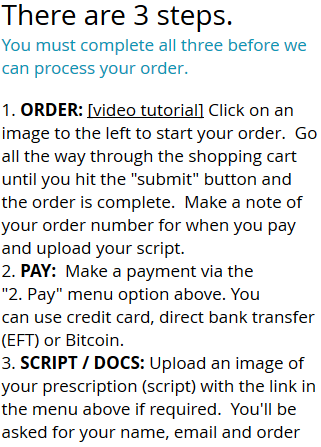 According to the information the information on their website, the third step for ordering here is upload a script/docs. I can assume that without this step, people can’t order anything here. There is some other information about the prescriptions but as much as it seems, generally, this online pharmacy has a serious attitude about prescription requirements. That is the reason why my rate for a serious attitude about selling prescription drugs is 5 points. LegitScript.com is a great website to check the reputation and legitimacy of an online pharmacy and that’s what I’ve done to check the legitimacy of the pharmacy that I’m now reviewing. 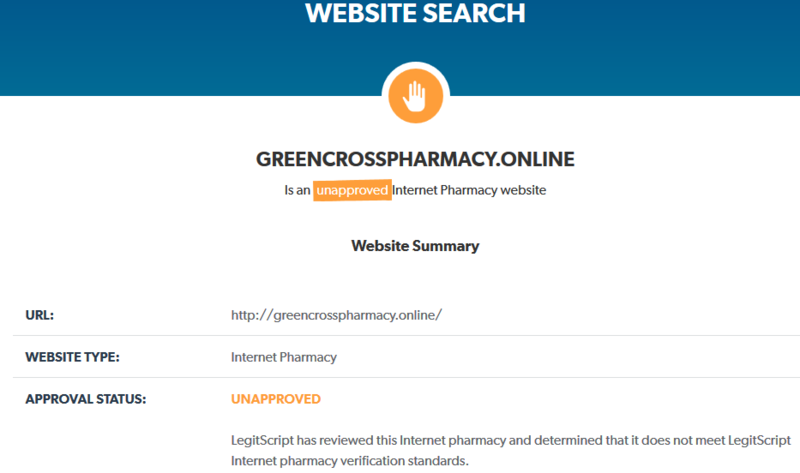 According to the legit script conclusion, green cross pharmacy is an unapproved internet pharmacy. This usually means that the company is violating some federal laws and regulations, nevertheless, they don’t seem to have really bad violations of the laws as this is not the worst approval status. Since this online pharmacy is not ROGUE but UNAPPROVED which is still really bad, but not the worst, that’s why I am able to rate them with at least 2 stars. Customer testimonials is an important factor of an online pharmacy, of any online pharmacies out there. To my opinion, all the customers needs have an opportunity to check what other users say about the services of the pharmacy or to have an opportunity to leave a review after buying from them. Customers’ reviews is a true way of ensuring the trustworthiness of the company or a way to warn others to stay away from scamming site. Unfortunately, this online pharmacy does not offer their customer such an option as you can’t write a review or reading others peoples’ reviews. There are no testimonials or a section where you can write down your experience. We cannot determine how popular or trustworthy this company is and that’s why I am going to rate them with 1 star out of 5 because lack of customer reviews on the site is quite a problem. Due to the fact that this online pharmacy is not having any customer reviews on their own website, it is obvious that I got seriously interested in finding out customer reviews on other sources – on foreign websites. Searching for customer reviews about this Green Cross Pharmacy online I determined that there is another pharmacy with same name but it is located in UK and so I only found some customer reviews about that pharmacy. 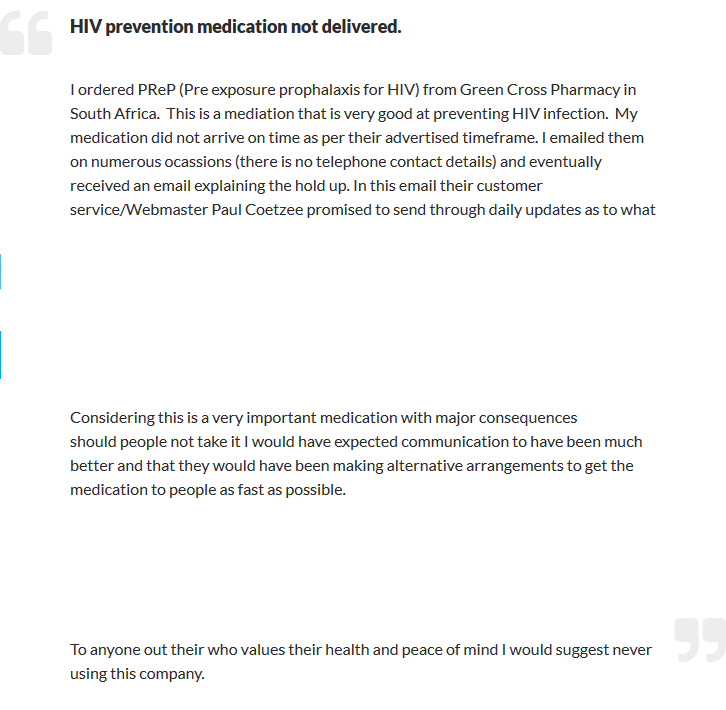 Nevertheless, I did managed to find a single customer review about this Green Cross Pharmacy in South Africa. Unfortunately, that’s a review suggesting to stay away from this company. It is obvious that I can’t make a conclusion based on a single customer, however the review is negative and this means a lot, exactly as it would mean if it would have been positive. But so far, a single customer review and especially being negative, deserves rate of 1 star for the customer reviews on foreign websites. According to the information on their website, the pharmacy does offer coupon codes. However, it is not as easy to get a coupon code. As much as it seems, applying for a coupon code it depends on your country and on their coupon codes page you can see how to apply for it yourself. As much as it seems, this PrEP coupon is only working for PrEP medications and it gives 10% discount and that’s it. Except for this coupon code, the pharmacy does not seem to offer absolutely anything else. No other forms of discounts, free pills, free shipping or anything else at all that may make you save some money. Getting on their Contact page you’re going to see that customers are able to get in touch with this pharmacy using the email, Facebook, phone number, post address or the contact form (which is basically the same as the email method). I think that this online pharmacy is deserving a rate of 3 stars for not a complete information – no physical address of the company is the worst problem. I have tried to get a consultation with their customer support and I did got a response back in a matter of a few hours and that means that the customer support is active and responding to message if you need some answers. What I did not loved is the fact that the answer arrived in more than 12 hours and I got a pretty short answer. My final rate is 3 points here. GreenCrossPharmacy.online is an online pharmacy that is mostly oriented in selling branded and generic PrEP and HIV medications. Nevertheless, a lot of other generic medications can also be found here. They seem to be a pharmacy in Southern Africa located, however an exact address was not shared. The prices for medication at this African pharmacy are super low – so low that we are not sure if those are real prices. 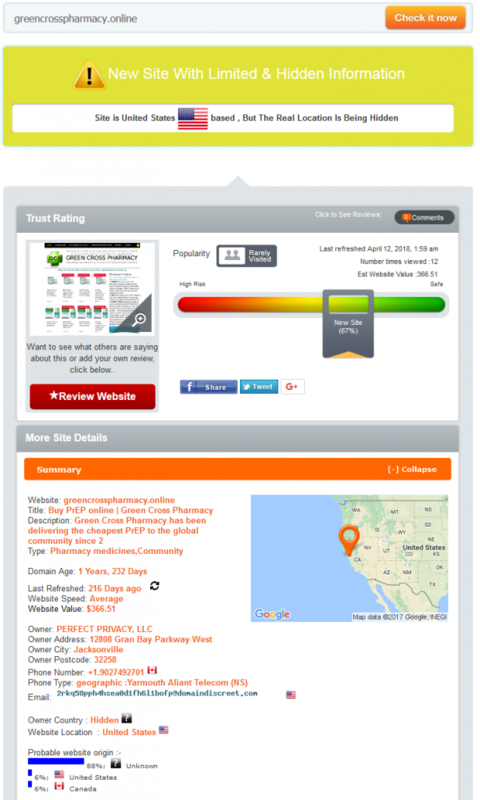 The company has a secured website but only 128 bit SSL encryption without an antivirus. The pharmacy offers a coupon code but it is hard to be obtained plus it is only for PrEP meds without any other methods to save money. Their customer support seems to respond to messages but there are 2 biggest problems: their legitimacy is very low and no customer reviews anywhere online except for one which is negative!